Concordia plays musical soundtracks for your life. Dreamy, mellow music. Soaring, sweeping songs. Even dark, edgy dirges, if that’s your life. Each time you press Play or Next, you get a unique song, that no one has ever heard before. 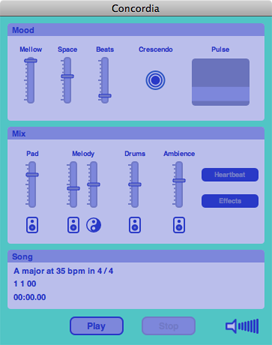 Tailor the music using simple controls to create your own genre. Or start with a station, like Meditation, Classical, or Electronica, and go from there. Want to listen to Concordia when you aren’t at your computer? Save a whole album to iTunes with a single menu command. Play it on your iPod. Burn it to a CD. Royalty free, commercial free. Play Concordia music (live or recorded) in your workplace, store, or club. Use Concordia tracks in your presentations, videos, movies, or games as either temp tracks or the final score. Listen to the tracks below to get a feel for Concordia, or even better, download the demo (requires no installation) and try it for yourself! Both programs have the same feature set. The difference is in compatibility, licensing, and cost. ©2007-2011 Scott Burgess. All rights reserved.